"So easy even I could make it, and I am a beginning cook! It looks very presentable for guests and takes only minutes"
I made this salad last night with some organic arugula. I used sesame seeds instead of pine nuts, but kept everything else the same. It was fast and extremely tasty! 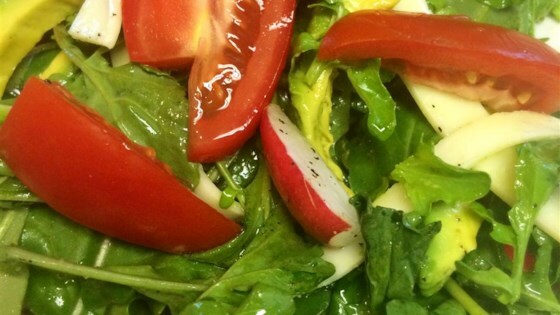 This dressing was sooooo easy and the perfect compliment for arugula. It was quick and tasted great. I don't think I have ever made a gourmet salad in such record time. This was great tasting and very fresh and light. Will make many more times.